A reliable source reports that SEIU is not happy that MCDCC voted to appoint Del. Will Smith over Del. David Moon to the District 20 Senate vacancy caused by Jamie Raskin’s resignation, in order to take up his seat in the U.S. House. Several members of the Central Committee who voted for Smith plan to seek elected office in 2018, and SEIU is already making noises about wreaking its revenge at that time. Whether this is just talk in the heat of the moment or serious, only time will tell. The outcome is interesting if only because the current MCDCC was packed with union supporters in the wake of union unhappiness with the Committee’s support for the all-Democratic Council’s position on police bargaining. However, while SEIU, MCGEO (county employees), UNITE and Mid-Atlantic Laborers supported Moon, the FOP (police) and IAFF (firefighters) supported Smith. Perhaps the outcome only speaks to SEIU and MCGEO’s relative influence compared to FOP and IAFF. In any case, the group of unions that supported Moon has promised to stick together during the 2018 elections. MCGEO’s efforts to throw its weight around in 2016 were notably ineffective. We’ll see if this new coalition has any more impact. Congratulations to my new Senator and homie William Colonel Smith Jr! Though I campaigned vigorously to represent the activist wing of the party, I know he’ll do a fine job. As I told the Washington Post, this is a proud moment for Montgomery County. It’s not always easy to write notes like these. However, it was not only the right but also politically smart approach. Rockville – UNITE HERE International Union today endorsed State Delegate Kumar Barve for Congress in the race to replace Chris Van Hollen in Maryland’s Eighth Congressional District. UNITE HERE represents 275,000 hard-working men and women in the hospitality industry across the United States and Canada, including approximately 15,000 who work in Maryland and Washington’s hotels, casinos, cafeterias, and airports. UNITE HERE members hail from all corners of the planet. The union, in conjunction with the AFL-CIO and thousands of immigrant rights activists, is pushing for comprehensive, worker-centered, and commonsense immigration reform and an end to criminalizing enforcement strategies. 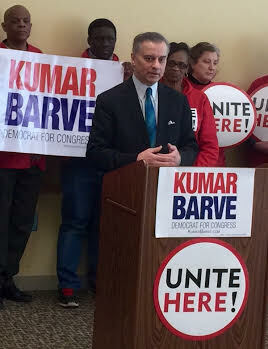 Kumar Barve is a fighter for working people and has stood with labor throughout his career. Delegate Barve supports the “Fight for 15”, expanded collective bargaining rights, and paid sick leave for all American workers. “Kumar Barve has been a progressive leader in Maryland and is responsible for moving Maryland forward. He has fought to increase the minimum wage, maintain the prevailing wage and expand workers’ rights. We need a leader in Congress like Barve who will bring people to get things done for the working families of the 8th Congressional District,” said Bert Bayou, Chapter President of UNITE HERE Local 23. “It is an inspiration to immigrant workers in our community that Kumar has used the story of his immigrant grandfather’s fight against the U.S. Government to retain his citizenship as the centerpiece of his campaign to provide dignity and opportunity for every American,” said Bayou, an Ethiopian immigrant now living in Silver Spring. “I am proud to receive the endorsement of the working men and women of UNITE HERE,” said Delegate Barve, Chairman of the House Environment and Transportation Committee. “In Congress I will continue to oppose union-busting and fight to raise wages and improve the living standard for working families,” said Barve.